Northeastern’s smartphone application delivers university news, maps, sports and other information to users anytime, anywhere. 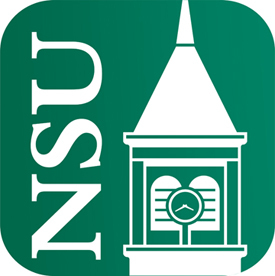 Smartphone users can now access the latest news, weather and sports for Northeastern State University on the go through NSU’s free mobile application. NSUOK is the official Northeastern State University quick reference mobile information app for all three Oklahoma campuses — Tahlequah, Broken Arrow and Muskogee. Northeastern’s smartphone application allows the university to communicate with today’s students in a way that is unique to NSU. It also allows alumni to stay connected to everything that is happening on the university’s three campuses. Users can download the NSUOK app for iPhone and Android smartphone by visiting the Apple App Store or the Android Market. The mobile app is also available for non-phones including the iPad and iPod touch. The NSUOK mobile app is compatible with iPhone, iPod touch and iPad and requires iOS 4.0 or later. The application also is compatible with Android 2.1 or later.